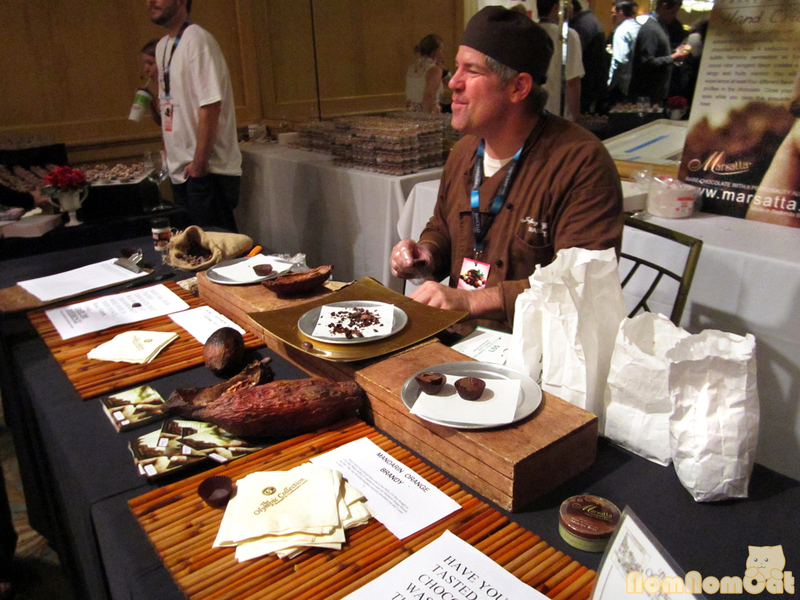 On December 29, 2012, Indulge Los Angeles hosted its third LA Chocolate Festival and Pastry Show (the 2nd having taken place in February 2012 and the first ever was in 2011) at the Olympic Collection just south of Little Osaka in West LA. We were familiar with this venue as many student organizations at UCLA have rented it out for banquets and other events… not to mention we drive by the Olympic / Sawtelle intersection often on our way to Nanbankan, Curry House, Tokyo Outlet, and other Little Osaka favs. 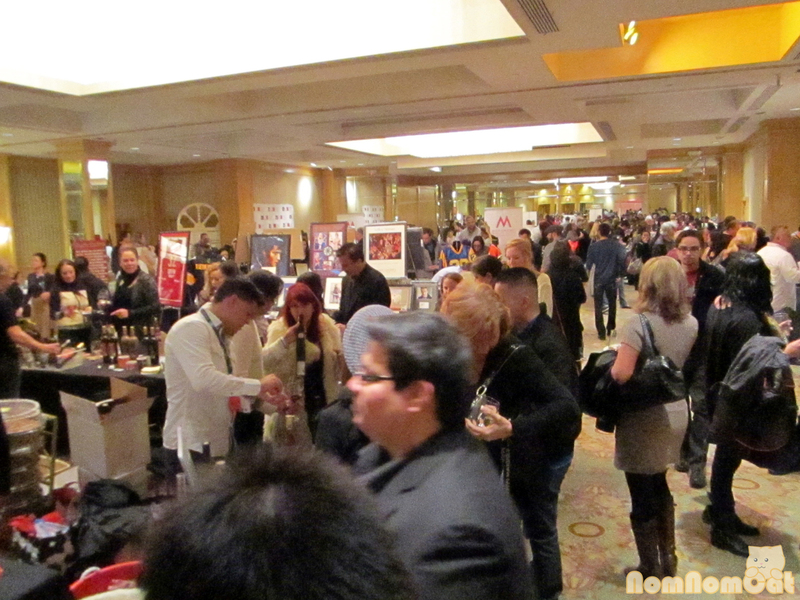 We lucked into a great deal on VIP admission so we arrived an hour before the doors opened for general ticket holders and leisurely wandered through the ballroom-turned-event-of-decadence. Barely 1pm and already the crowd was growing quickly! After checking in and receiving our souvenir wine glasses, we were greeted by the friendly fellas of Cake Buzz. Known for their booze-filled confections, they were swarmed by patrons eager to sample their beautiful cakes… and to get the party started. 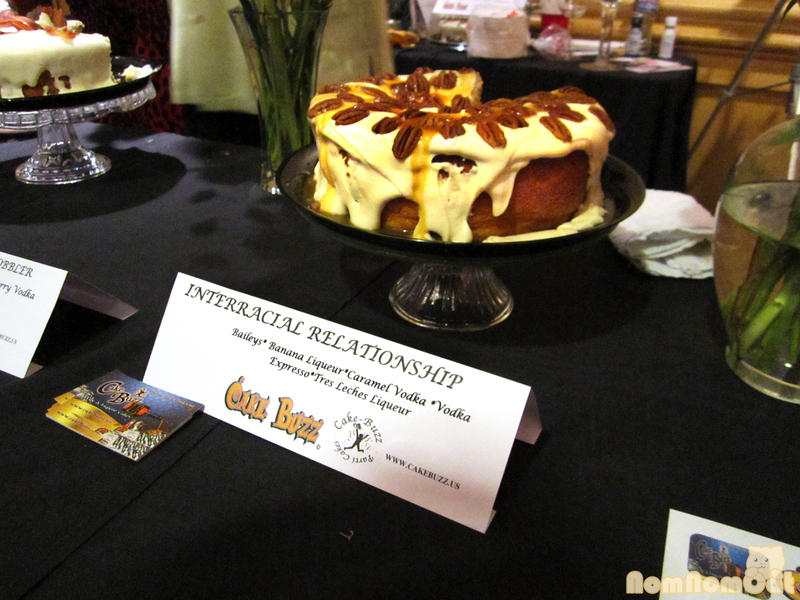 I went with the maple bacon cake — Crown Royal Maple, Bakon Vodka, & Tres Leches Liqueur. Perfectly crisp bacon draped over a moist white cake just sweet enough to benefit from the savory pop of porky goodness… everything really is better with bacon. Martin asked our friendly fella which one he liked best and ended up trying the Interracial Relationship, consisting of Bailey’s, Banana Liquer, Caramel Vodka, Vodka Expresso, and Tres Leches Liqueur. 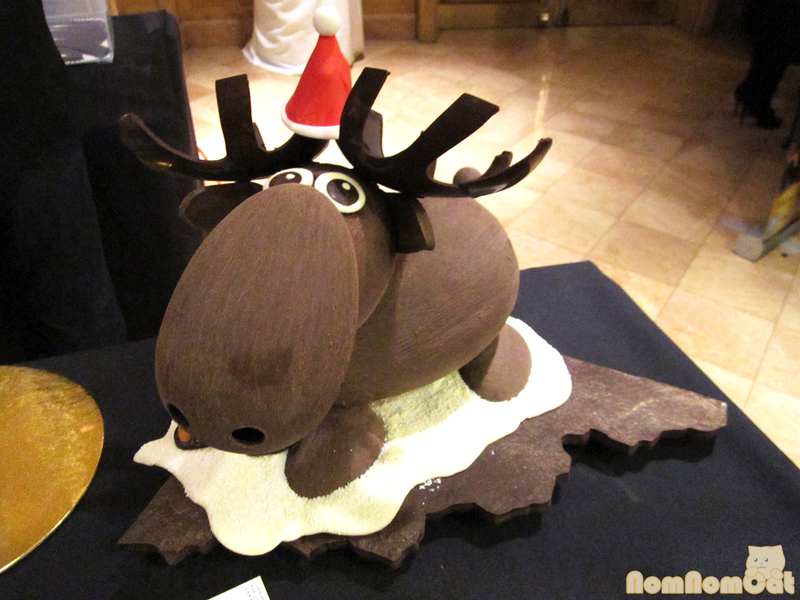 Moving down the line, we were greeted by a friendly and festive chocolate moose at the Art of Pastry – Stephane Treand. We were also treated to a bite-sized piece of dark chocolate with a fragrant yuzu-scented ganache center and crispy nibs on top. 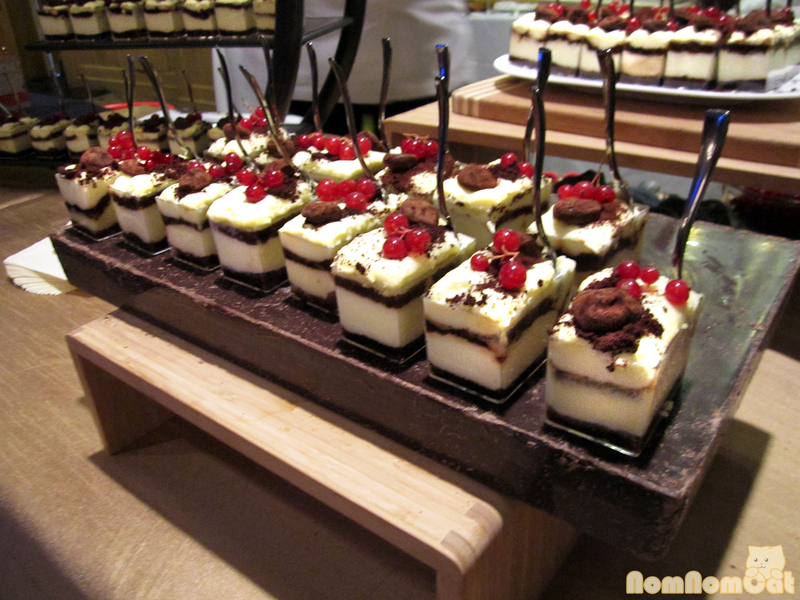 Even though we had come early, the venue was already pretty packed full of chocoholics and aficionados. 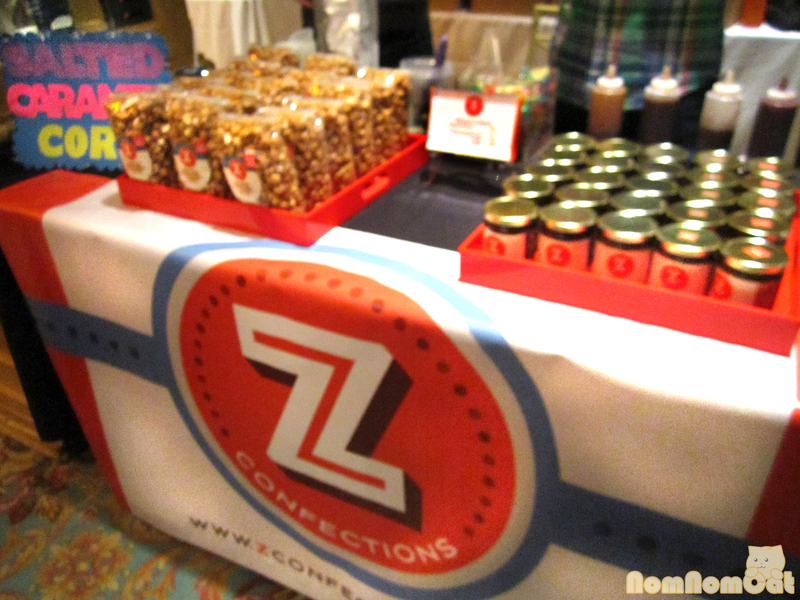 We snaked our way through the clusters of people and stumbled upon this non-chocolate find — spicy salted caramel corn from Z Confections based out of Downtown LA. A rare, non-chocolate sweet treat! I think my favorite table of the day, however, was Montage Laguna Beach. 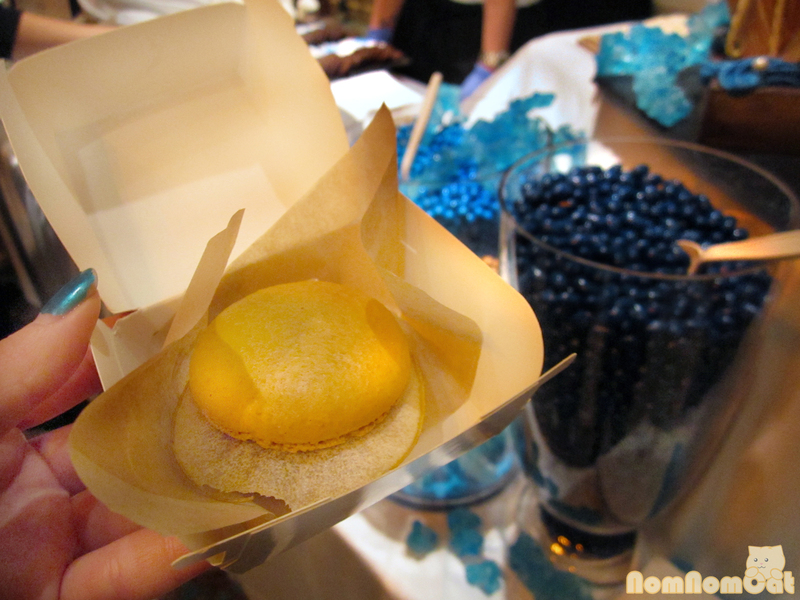 Decked out in blue-hued confections, the setup was very aesthetically attractive but to me, what really stole the show was just how excited Executive Pastry Chef Lee Smith was about sharing his latest creation with us. And excited he should be, for the little macaron-bunned “burger” topped with rich chocolate ganache, Bartlett pear gel, and a crisp paper-thin slice of pear was absolutely divine. 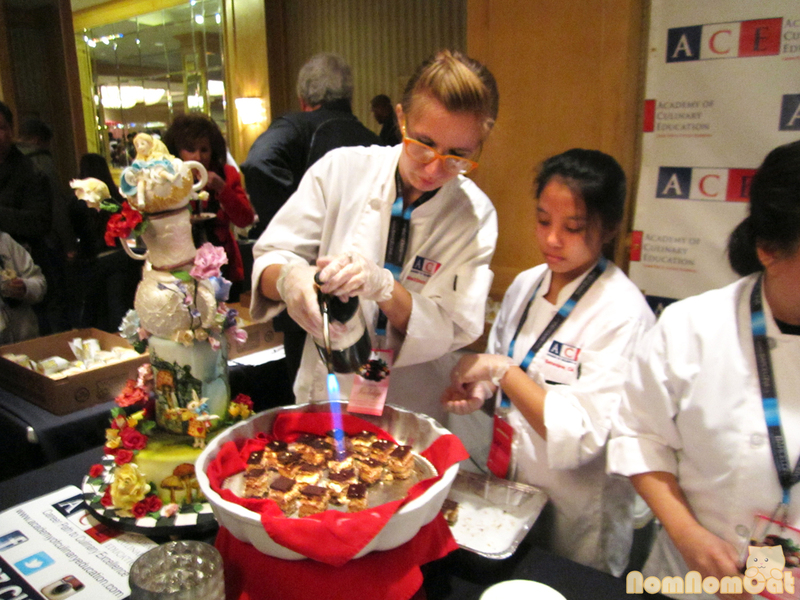 It was so fun to eat and it tasted delicious, probably more so after seeing how much love went into its making. 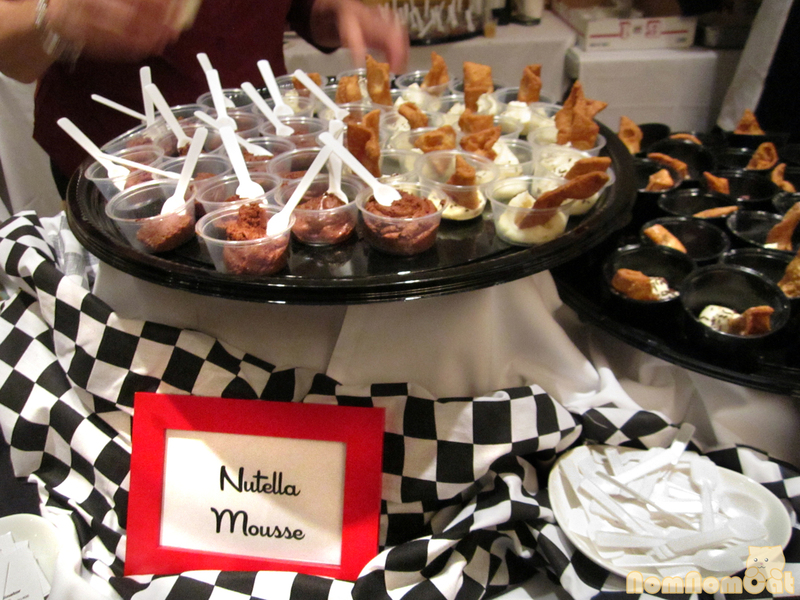 When I was a kid, I had a fondness for chocolate mousse desserts, so when I saw these adorable plastic cups filled with Nutella mousse, I made a beeline for Maria’s Italian Kitchen. The mousse was fluffy and rich, but a tad too sweet for me. After all the pastries and candies we had tasted, this ice cold selection of ice creams and sorbets definitely hit the spot. 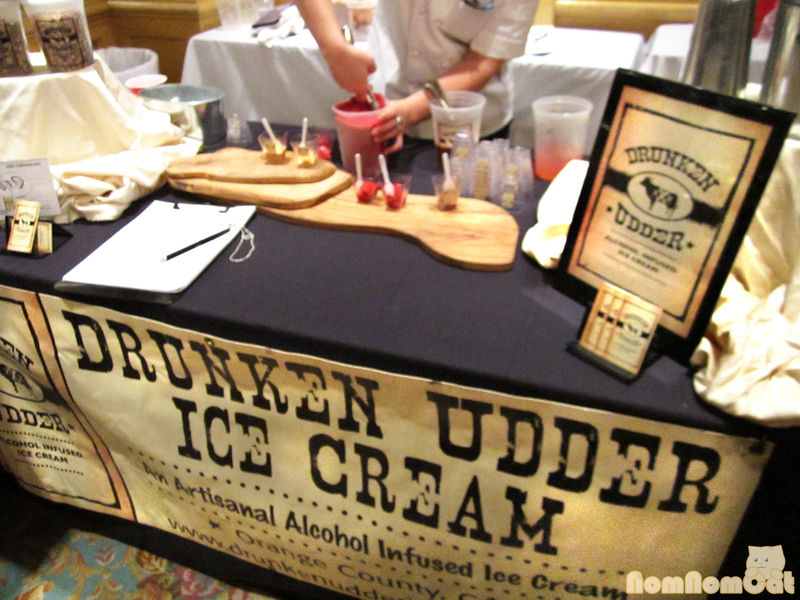 Following suit with desserts that could get you tipsy, Drunken Udder formulates delicious flavor combinations such as caramel espresso (Martin’s favorite) and raspberry orange sorbet (my favorite). We’re big fans of the stone ground chocolate from ChocoVivo, so we were pretty excited to sample the wares of Marsatta Fancy Chocolates. The amiable man we spoke with explained that they source very high quality beans and so they don’t need much in the way of additives to develop the flavor of the final product. They have a small factory in Redondo Beach, and we might drop them a line to see if we can take a tour! We spied this gorgeous display from across the room and salivated as we watched passers-by digging into their little plastic cubes of creme and chocolate. Of course, it belonged to The Four Seasons – Beverly Hills. Tasting one for ourselves, we discovered it was a tiramisu type of dessert – lots of marscapone-based fluffy creme between moistened layers of cake. Delicious! I’ll be perfectly honest — I’m not a huge fan of the many (MANY) pho places in LA that bear names that playing on the Americanized pronunciation of the noodle soup… like fo’ sho’. 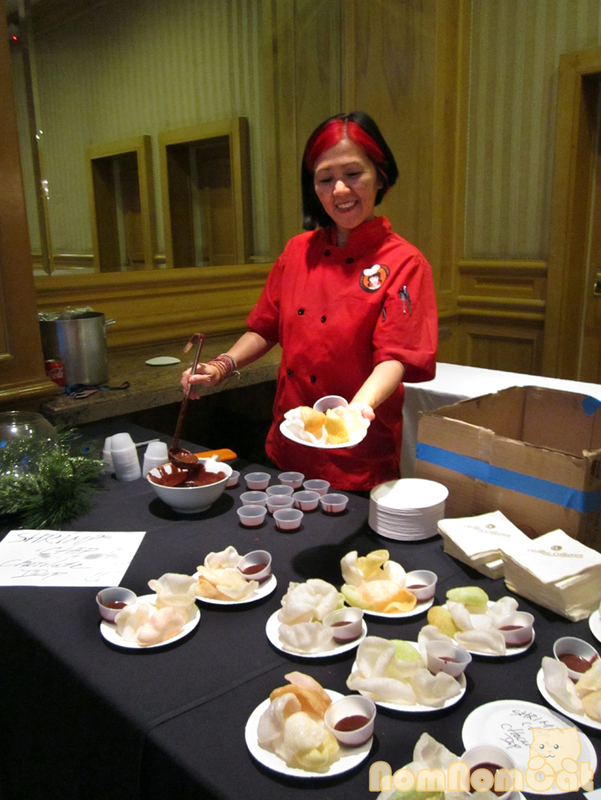 But when we saw the bright and welcoming smile on Kimmy Tang’s face, we just had to try what she and 9021PHO had to offer… puffy fried shrimp chips (bánh phồng tôm) with a chocolate dipping sauce. The secret? The sauce had a very familiar tang of fish sauce (nước mắm) and was actually a pleasant surprise to my palate. A very creative way to incorporate chocolate into Vietnamese cuisine… or is it incorporating Vietnamese cuisine into chocolate? 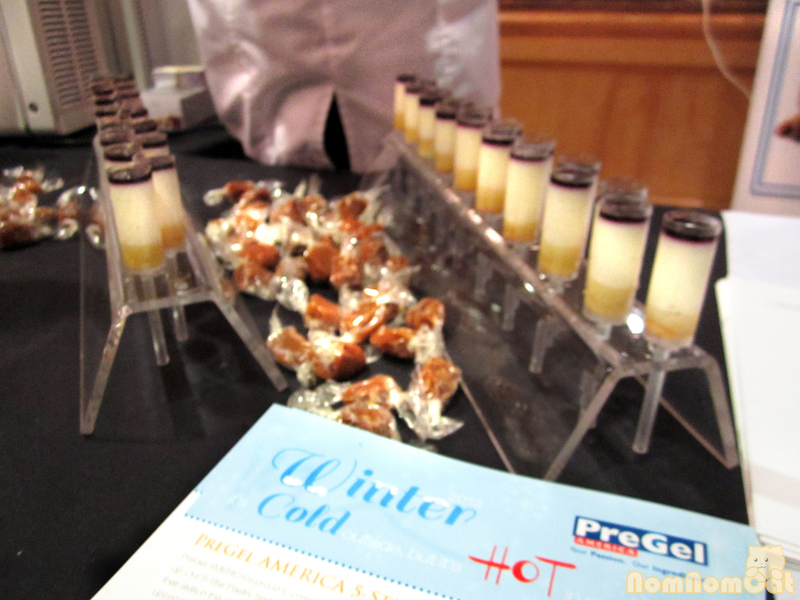 Finally we made our way back up to PreGel and picked up an adorable push-pop-style dessert. Ingenious design. Could you tell just by sight what the flavor was? The layers of colors were unmistakeable to me, and Martin (who ate his first) confirmed: it’s a blueberry cheesecake! Anyone remember those good ol’ push-pops?! We did pop downstairs briefly to check out the Sugar Lounge but it felt too reminiscent of a college frat party for our taste. Although, I’ll have to admit the ice luge that Ventura Limoncello had set up looked pretty impressive. All in all, it was a fun event and a great way to spend a few hours on a dreary winter Saturday. It was also an awesome opportunity to meet some very passionate and sweet (pun intended) people and see them proudly showcase their work. Looking forward to checking out the next event! 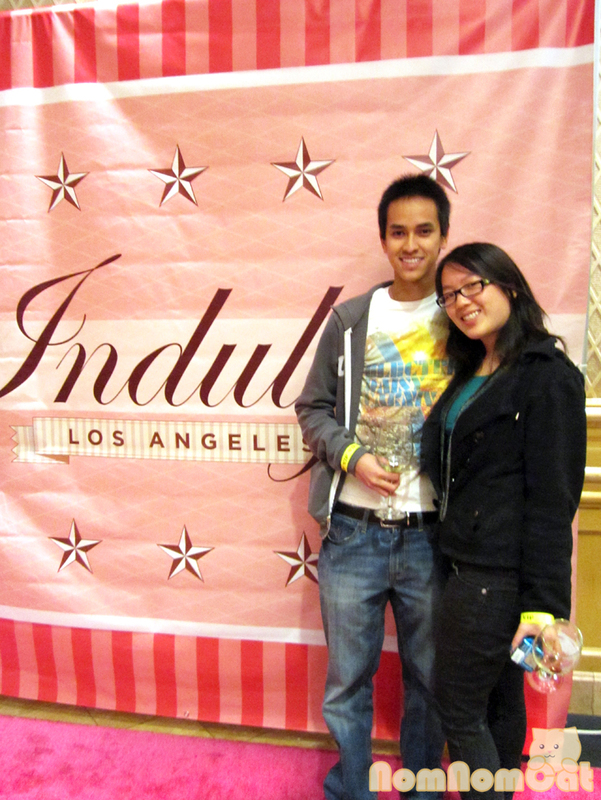 For more information, check out Indulge LA’s website: http://www.indulgela.net or follow them on Facebook!